A signet ring is a great piece of jewelry for you or for someone else. You can personalize the item by adding a monogram on the top face as well as add engraving to the inside of the ring. When you shop for signet rings with deBebians.com, we have super helpful filters on the main signet ring page. Here is our main page for ladies signet rings. The first thing to consider is the face shape you are seeking. Personally, I prefer the oval shape. The next thing to filter by would be price. This way you can sort them from low to high price. In my opinion, the next filter to select is the back type. We offer two different back types, solid and open. Check out this previous blog post to read more about the difference between the two and to see exactly for yourself which design you want. We sell both back types and it ultimately comes down to personal preference. 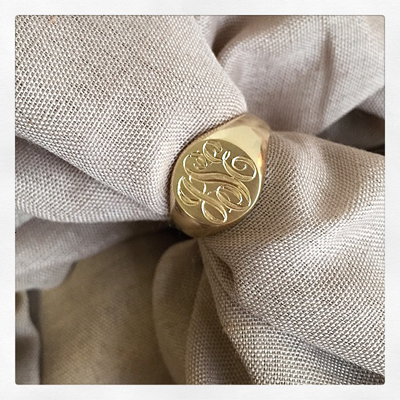 Once you have selected your signet ring, the next thing to consider is engraving. We offer three different options for engraving as well as four different engraving styles (or layouts). You can choose from computer engraving, laser engraving, or hand engraving. Prices and look vary so be sure to scroll down to the bottom of the product page where it says ‘engraving time tables and real photo examples’. Here you can click to view different engraving examples. My favorite is the hand engraving and while I know it’s more expensive, it’s very classic and timeless. Once you select your engraving option, you need to consider the engraving style. My preference is #4 but #3 is also quite popular. Traditionally, the initial for your last name goes as the center initial in the monogram. We ask that you enter the initials in the exact order you want them to appear from left to right on the monogram. For example, if your name is Jane Elizabeth Smith, enter JSE. You can now also personalize your signet ring even further by adding an engraving to the inside of the band. If you need help with a signet ring and/or have any questions for us, do not hesitate to call on us. Edit: This blog was originally published on July 31, 2015 and updated with new information on February 26, 2019.